With Nas, Kid Cudi, Travis Scott, Pi’erre Bourne, and more. A mountain view with a hint of Kanye. Back in May 2017 it was reported that Kanye West was busy working on the follow up to The Life Of Pablo in the Wyoming mountains. Not much happened after that however, Kanye has been spotted back in the area in recent days alongside a raft of rappers and producers. The long list of collaborators spotted embracing the cold weather include Kid Cudi, Nas, Travis Scott, King Louie, and The-Dream as well as regular producers Mike Dean and Jeff Bhasker. Wheezy, and Pi’erre Bourne have also been spotted in town. Most of these spottings have been documented on social media, either by the musicians themselves or fans. 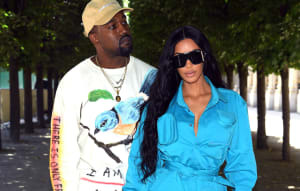 Kim Kardashian's socials have also proved a vital source for tracking 'Ye's whereabouts. Check out the latest from Wyoming below. The FADER has reached out to Kanye's reps for comment.